AOPA presents the "Never Again" series in AOPA Pilot magazine and online to allow pilots to learn from the experiences of others. Operating in the Los Angeles VFR corridor seems safe enough, at least until the weather conspires against you. By Steven Mark Sachs. An IFR flight in central Europe makes an American pilot long for the good old FAA. By Robert Tompkins. A Meridian pilot learns the true purpose of training, and any pilot at any time is capable of making a mistake that leads to a dangerous situation. By John Smith. Most pilots would agree that gambling with an airplane is a bad idea. See how one pilot found this out. By Donald Burkley. Have you ever declared an emergency? Have you ever considered it? Ride along in instrument weather with a failed HSI. By Austin Kallemeyn. There's darkness, and then there's middle-of-nowhere darkness. Add in a low cloud base and you've got the recipe for an uncomfortable flight. By Tom Haack. An oft-practiced landing technique pays big dividends in the real world when smoke fills the cockpit and the engine self-destructs. A Civil Air Patrol pilot on an Angel Flight mission realizes the importance of patience when he finds himself nose to nose with another aircraft at 100 feet off the deck. By Dale Brown. When the runway lights go out at night while you're enjoying an electrical failure, decisions have to be made--and quickly. By Gary Souder. A sod farm makes a fine landing field until it's harvested. Prepare for a bumpy arrival in "Ninety-Degree Turn on Takeoff" by Tom Haack. On a 10-minute VFR trip, a Cessna Skylane pilot wanders into unforecast IMC. What to do? By Peter Boody. Always perform a visual inspection of the fuel in your tanks. By Jerry Hawkins. A hand-me-down checklist causes problems during an engine failure after takeoff. By James Carter. A Cessna 210 flying in the Bahamas is suddenly filled with blinding smoke. What would you do? In this episode, a Zenith 601 XLB pilot finds himself unexpectedly upside down--twice. You might want to grab that helmet and ride along in "Surprise Encounter," by Bill Thomas. Erratic airspeed indications, including a 70-knot indication while plugged into ground power. You trust your ASI, don't you? Compare your answer in "Just Like the Real World," by Harvey R. Greenberg. High over the North Atlantic, a King Air pilot inadvertently causes a complete electrical shutdown. Stray on the oxygen and fly along with "Gang Bar Down," by Dan Gleason. When the gear fails to retract, a Grumman Goose pilot attempts an extraordinary repair with a most unusual tool. A low-time Cessna pilot pays a social price for an incomplete preflight. Main gear down and locked, nose gear still up in the nose. What would you do when a prop strike is the least of your worries? Find out what a cargo pilot did! An iced-up Baron is hard to land when the pilot can't see out the front. Pull on your warm gloves and ride along! A Colorado pilot on a VFR mountain cross-country has few options when encountering a wall of clouds. Oxygen might be a good idea! A Cherokee pilot is cautioned to not to try to scare his passenger, only to find out how scary an engine failure is for all aboard. It's clench time! A ski landing on the Alaskan ice succeeds ... by inches. A hurried takeoff induces an Arrow pilot to miss a fundamental engine control. A Bonanza pilot suffers a catastrophic engine failure but lands safely using a synthetic vision system. Hot weather, an overloaded airplane, and bad advice create a dangerous chain of events. Be glad you're on the ground! In the chaos of a forest fire, a reconnaissance pilot forgets rule one: fly the plane. When the alternator fails, the battery is supposed to be good for 30 minutes. But when it quits after only 18, how do you get the gear down? A dual alternator failure in IFR, at night, on a twin just out of annual - what could possibly go wrong? Have your flashlight and raincoat handy and climb into the right seat. The possibility of landing at night in the country's biggest swamp motivates a Cherokee to fly an engine-out approach very carefully. A newly-minted instrument pilot falls into the impending clearance trap. Cinch up that harness and expect some turbulence! An unsuspecting cross-country pilot gets "thumped" by an F-16. Poor decisions are made to satisfy an impatient right-seater. A 172 pilot on a family outing encounters the perils of flying IFR - standing for "I Follow Rivers." It's nice having a deep-voiced controller to save your bacon when you're icing up in hard IMC in the mountains. Interesting things happens when a Maule pilot attempts a night landing with no runway lights. An Archer pilot considers his options in the fuzzy area inbetween IFR and VFR. Assuming he's all alone at a remote strip, a back-country pilot neglects to use the radio to self-announce ... as does the other pilot in the pattern. Flying in and out of tiny airstrips in the jungles of the Philipines creates unique challenges, and a podcaster tries to pronounce Philipino names in "Lagubang Lessons." Turbulence, wind shear, and the necessity of tightening your seat belt to avoid continually banging your head on the airframe all contribute to a memorably uncomfortable flight. A 172 pilot learns that not everyone loves airplanes as much as pilots do. If it weren’t for the roar of the 230-horsepower Continental engine, you could have heard a pin drop. We would have preferred to hear the gear drop. A 182 pilot gets two post-maintenance surprises. A Bonanza pilot discovers that there is normal "Chicago winter cold" and then there is "popped-door winter cold." A Champ pilot underestimates his passenger's weight with nearly disastrous consequences. Two military aircraft arrive at the same beacon simultaneously, with one going twice as fast as the other. A checkout flight of a home-built causes a pilot to appreciate stall awareness training. 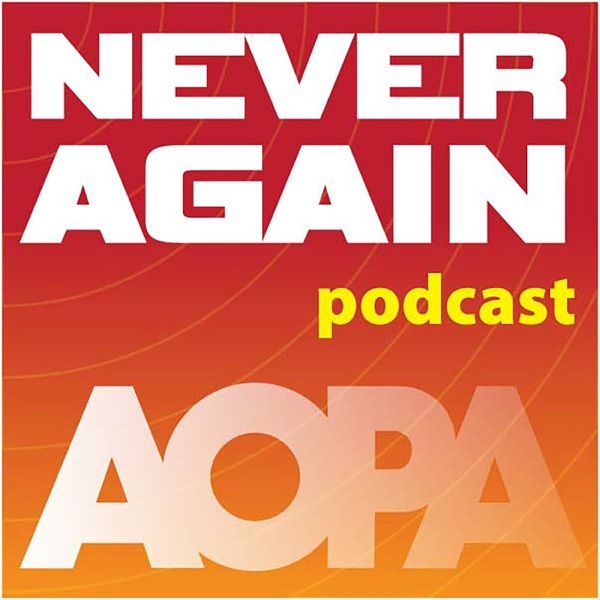 As a celebration of AOPA's 75th Anniversary this month, Never Again podcast offers this special vintage episode "Snakes Alive!" by Max Karant, originally published in the 1959 issue of "AOPA Pilot" magazine. A Beech 18 freighter pilot hauling newspapers deals with an in-flight engine fire. Preoccupation with a newly-installed engine monitor diverts a Bonanza pilot's attention from a far greater problem. An Air Force cadet in jet fighter training learns the dangers of scud running. An air ambulance pilot uses an unusual and improvised landing technique to compensate for an inoperative nose gear. In this episode, a cross-country pilot learns the disastrous results of losing a propeller tip. Find out what happens in "One of Those Nights," by Beverly Howard. A student pilot on a spectacular cross-country through the Arizona desert learns the consequences of disregarding wake turbulence on final approach. Listen to the June 2013 “Never Again” story: A date with his girl. Listen to the May 2013 "Never Again" story: A slap in the face. Listen to the April 2013 "Never Again" story: Big Sky mission. Listen to the March 2013 "Never Again" story: To sleep, perchance to dream. A Centurion pilot on a dull cross-country flight learns how easy it is to fall asleep at the yoke. More than 25 years ago I bought a used Beech Baron 58. Within a week of my purchase, a longtime mechanic friend phoned: "I don’t mean to meddle. Be leery of Beech fuel gauges. Know your fuel by time and fuel burn." A Saturday pleasure flight in flawless weather lulls a pilot into meteorological complacency with stress-causing results. A Skyhawk pilot and musician listens to the music of his engine, and doesn't like what he hears. A Cardinal pilot confronts a failed elevator trim and the attitude that pilots with more hours and experience always make better decisions. Find out what happens in "A Loud Bang". It's not unusual for a pilot who flies regularly at night to suffer an optical illusion concerning lights. The most common one is seeing Venus low on the horizon and thinking that it is an oncoming landing light. There is an infinite variety of other visual traps. I have had two experiences, one as a pilot, and one as an air traffic controller. My friend glenn co-owned a 1968 Cherokee 180 and wanted to visit a mutual friend who was staying at a cabin in Happy Camp, California. He was slowly taking lessons, so we flew together a lot. The little Cherokee was a basic VFR airplane with questionable VOR reliability, but everything else worked fine. I was confident as a 100-hour-plus pilot and looked forward to the trip from Reid-Hillview Airport in San Jose to Northern California. The weather forecast called for some clouds, but I knew there was VFR weather inland a little over the Central Valley and along Interstate 5. This was long before GPS or even Loran, so it was going to be pilotage and dead reckoning all the way. In 1985 I had purchased a low-time creampuff 1955 Cessna 180. N9370C was based at Camarillo Airport, roughly halfway between Los Angeles and Santa Barbara, California. The 180 Skywagon is slightly bigger than its counterpart, the Cessna 170, but flies as well with no bad habits. The big 225-horsepower Continental up front provides great performance, and I suspect it will lift just about anything you can stuff in its cabin. At 10:25 on Easter morning in 2010 I held up my hand to shield the sun as I searched for the traffic at my two o’clock, 1,000 feet above. The air was smooth at 11,500 feet, above solid clouds and the rugged Washington Cascade mountains below. My family—parents, wife, kids, spouses, grandchildren—had gathered for the holiday that weekend, and now I was getting everyone home. It was a typical overcast winter morning at Portland International Airport in Oregon, with ceilings running around 1,400 feet agl and reported tops at about 7,000 feet msl. Ground control had just rattled off our clearance to Rogue Valley International in Medford, Oregon, clearing us to 10,000 feet. There had been no pilot reports of icing. The briefing called for conditions to remain overcast with ceilings around 1,200 feet. Deteriorating conditions and possible snow were forecast for later in the day, but well after our estimated arrival time. "I was a freshly minted private pilot, and I was nearing that ego-boosting 100-hour mark. I was itching for a 'real' mission--a long and exciting cross-country flight." A sailplane pilot unintentionally transitions to an open cockpit. "A low time VFR pilot on a long cross-country flys into IMC and learns to appreciate thorough training and helpful controllers..."
Never Again: Paper or Plastic? A mid-air encounter with a plastic grocery bag initiates a chain of maintenance headaches for a 2001 Cessna Skylane 182T pilot. "About 50 feet above the runway a large white plastic bag. The prop immediately shredded the bag with seemingly no ill effects. However, at 400 feet, there was the unmistakable smell of burning plastic..."
"Get-there-itis," maintenance issues, and an inaccurate forecast conspire against a cross-country Cessna pilot. "I was a disoriented, low-time VFR pilot in IMC, without a working radio, in Class C airspace, near a large airport. I knew this was often how accident reports began - or ended..."